Our 2009 year in review continues with the month that nearly always comes third. March! 2009’s version featured the tear-jerking debut of Blizzard’s official, “give us suggestions for things to fix in v1.13,” thread, the arrival of the giant Orc Wolfrider statue at Blizzard HQ, some pot-stirring comments from Bill Roper re: D3’s design, and some cool game feature debuts such as a good look at the (then) current inventory window. Relive those and other moments in the summary below, and tune in tomorrow for coverage of April 2009. January, February, March, April, May, June, July, August, September, October, November and December. March started off by going old school, with Bashiok requesting community suggestions for things to be fixed or improved on in the Diablo 2 v1.13 patch. Hundreds of Diablo 2 loyalists replied, filling a thread that Blizzard has never since viewed, at least judging by most of the player feedback in v1.13. Jokes aside, January will mark the eleventh month since Blizzard actively solicited community commentary on the patch. The entire D2X: Lord of Destruction expansion pack was completed in twelve months! If everyone still playing Diablo 2 chipped in a few bucks, could Blizzard hire another programmer or two to just work on D2 patches? Also on March 3rd, our WoW sister site reported that the massive (life size?) Orc Wolfrider statue had been delivered to Blizzard’s headquarters. It wasn’t erected until the 17th, and as of July 1st the installation is still under construction. It was finished, however, by our pre-Blizzcon visit in August 2009. No, you may not sit on the wolf. The fifth brought another of March’s many Bashiok forum posts. This one had a little extra intrigue, as he answered a question about item upgrades with another question, “where is the system in Diablo III that allows us to make base weapons more powerful? That?s a question that will have to be answered at a later time.” Bashiok and others constantly tease with mentions of game features that have not yet been revealed. Let’s hope that these various secret systems are as cool in reality as our imaginations make them. On the 17th, Diablo 2 producer Bill Roper made some of the most honest and interesting comments about Diablo 3 that we’ve ever heard from any of the D2 team. Amongst his remarks, Bill lamented the loss of the unique visual style that had filled D1 and D2. He didn’t dislike D3’s look, but said it was more of a “Blizzard Irvine” look than a “Blizzard North” look. Bill commented on D3 again in an interview posted a week later, with some slightly backhanded compliments about the look of the game. On the 19th the first update of the Battle.net 2.0 era launched, with a new interface and integrated accounts. This is only the very beginning of the changes, which won’t be fully seen until SC2’s launch, assuming that glorious event ever transpires. The 24th brought some interesting news, when Blizzard was forced to somewhat grudgingly confirm that yes, they did have a 5th game project under works. More clarifications came the next day: the fifth game is not related to their 4th game, the unannounced next gen MMO, nor is it a sequel to WoW or any other known Blizzard game. Speculation ran (and continues to run) wild, with no clear consensus of ideas, though more recently evidence that this fifth game will be for consoles has grown stronger. It’s also well-known that many Blizzard employees are FPS game fans, and the fact that Blizzard has never produced a title in that genre (thanks to the cancellation of Starcraft Ghost), is an interesting fact. Whether the fifth game has anything to do with their puzzling acquisition of the Redneck Rampage copyrights and trademarks, remains to be seen. March 2009 ended with a bang, thanks to Blizzcast #8. 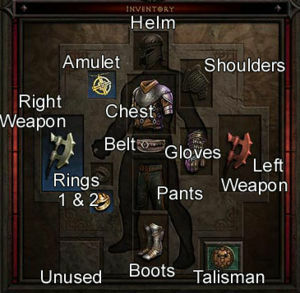 This installment talked extensively about Diablo 3, with a special emphasis on the user interface, and some screenshots showing off the many changes and improvements made since it was last seen at Blizzcon. Naturally, word came just a few days later that there were already changes to this version. All of March 2009’s interviews and major media. All of March 2009’s news headlines.